Do you trust television advertising? With all of the technology advertisers have at their disposal today, I am becoming increasingly disillusioned with advertising in general and television advertising in particular. 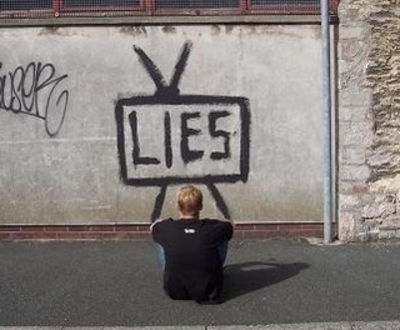 Do you trust television advertising? Why or why not? Love that picture! I absolutely do not, I hate adverts with a passion. I find advertising to be false and purely motivated by company needs to make profit. Ads deceptively lead people to believe that a product will transform into them something their not. I know, it's great. The website I found it on has other really great images. No, I don't trust them, particularly when it comes to skin/hair care products. They always show a picture of a flawless looking woman who was never old enough to need the product in the first place (e.g. anti wrinkle cream or removing grey hairs). Nope, not even a little. If I did, then I would be sure that oil pipelines are completely safe and never spring leaks, but when the unexpected occurs that a crew of trained professionals will arrive within second, armed with Dawn detergent to clean off the animals and leave the spill site looking and smelling better than it did prior to the pipeline. Ahem, yeah right. Do you hear that Enbridge?!?! Stay outta my province, you're not wanted here and your deceptive ads are not fooling anyone!! (because I'm sure the execs at Enbridge Oil are reading TVode, I mean, why wouldn't they). BTW, I also think the photo rocks, good choice! Thanks. And, hahaha, you never know. As an undergrad, I had a task which involved doing a book or chapter review, we then had to post online. I accidently got something wrong, and the author of the text contacted me and abused me. I certainly wasn't expecting that. In any case, any act of defiance is worthwhile because it raises awareness. That sounds like a ridiculous ad. I mean, do they actually believe they will convince their audience by so blatantly underestimating their inteligence? My mother used to say she would not buy anything that was advertised. This is some 20 years ago when there was less ads on TV! I think i have inherited that gene (yet to be discovered which one it is!) as I think the same. The ads annoy me so much that I often think I will not use or buy that product -apart from the AAMI ad with Katut which I used to love. Pleased that they stopped the ad however before we got sick of it. No, i do not trust tv advertising as it annoys me so much! I've too vowed not to buy certain products or from certain businesses because of their advertising. The lengths some advertisers will go to are repulsive. When the adds start, I just turn to another channel! But having said that, Like Finy, I did LOVE the Katut add, & would watch that one, waiting & waiting for the next episode to come on! I was hoping & hoping the 2 of them would marry in real life life, but of cause they didn’t!!! Neighbours – Will Daniel get busted receiving Dakota’s order? Bold & The Beautiful - Should Bill tell Liam, Wyatt & Hope the truth? Neighbours - Should Naomi tell Mark she kissed Paul? Bold & The Beautiful - If you could portray any one of the characters on the B&B, who would you choose and why? Who is your favourite MythBusters’ presenter? Bold & The Beautiful - Is Rick cheating on Caroline? Do you feel uncomfortable when talking to somebody wearing a low cut shirt? Have you or would you ever renew your wedding vows? Have you ever come face-to-face with an alligator or crocodile?